Sun Noodle is a custom, artisan noodle maker founded in Hawaii in 1981. Since then, Sun Noodle has opened locations in Hawaii, California and New Jersey, where the company produces approximately 90,000 portions a day. Sun Noodle recreates the authentic taste of Japanese ramen noodles for customers and manufactures over a hundred types of products, from fresh custom ramen to gyoza and wonton skins, for both restaurants and retailers. 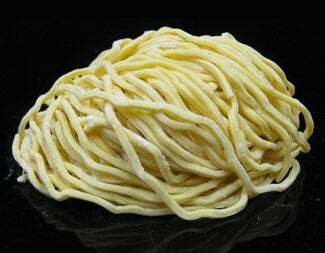 The special noodles from Sun Noodle used in our dishes are made using a unique, rich mineral water, resulting is a firm, flavorful, pale yellow noodle. Ramen is a brothy noodle dish that became popular in Japan in the late 1800’s. The special noodles used in this dish are made using a unique, rich mineral water. 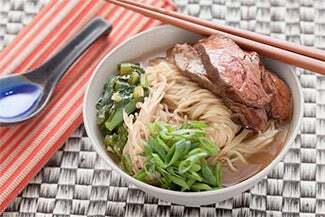 The result is a firm, flavorful, pale yellow noodle that stands up to the earthy enoki mushrooms, tender flank steak and choy sum in this classic dish.